Haven't posted in nearly two weeks so I thought I might just talk about what I have to do to complete my Muscovite army for WECW and Picquet 'Anchor of Faith'. On the painting table are a unit of 10 Essex Jiltsi lancers which are very nice figures and will look great on the table (nearly finished these). I willl then start on 3x20 man of Streltsi in yellow, orange and light blue and then 3x40 man new soldier regiments (one unit done already in blue). The new soldier regiments were modelled on the Western style but soldiers wore Muscovite costume, so musket and pike regiments in differing kaftan colours (should look great). 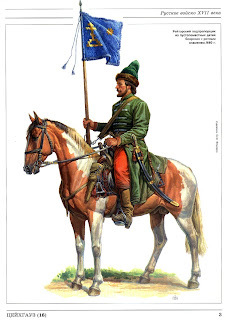 I have just ordered another 30 Cossack cavalry who will be converted into the new regiments of Muscovite cavalry, the picture shows how these looked. The picture comes from a Russian magazine (Zeughus?) and I would like to thank a much better informed and friendly enthusiast for supplying this. When the Old Glory figures arrive I will add pistol holsters from Redoubt miniatures and ensure that they have headgear that is more appropriate for Muscovite soldiers. There will be 4x8 man units (2 figures added from the Essex Ottoman range), and will be classed as gallopers in WECW (mostly raw and average) but they will only fight in single line (no rank bonus). After I paint the cavalry I will add one German mercenary unit of cavalry of 10 men (Essex Miniatures Polish Rajtars and Arqubeusiers with Redoubt head swops), and that will be all I need to paint. I have enough Cossacks (foot and cavalry) that can used in the army and also Tartar light cavalry but I need to finish two more guns and crew. That will be the army and then onto completing my Poles, Swedes and starting my Ottomans. I have been busy using the credit card in the last two weeks (don't tell Ingrid) and suprise, suprise everything has arrived on time. I recieved the second and fantastic volume on the GNW from Dan Schorr in the US (Acedia press book on Russians, Saxons, Danes and Prussians), lots of great detail on flags, uniforms and unit organisation. Russian flag details will be used on some of my Muscovite units. I also recieved another two cavalry unit builder packs from TAG (11 days to Australia), I got another unit of Polish Pancerni (2 TAG units now) and a unit of Ottoman Dellis as well as a Jannisary cooking pot and a nice little free Ottoman Jannissary commander. What can I say guys, these are just wonderfull figures that are very good value in unit packs especially with free postage to Australia (order before the offer stops). I also recieved the first of three books that I ordered from Sweden on Karl X, this book on Carlbom is 97 years old and has soooo much detail on the Swedish and Finnish regiments in Karl's army but more interesting I finally have information about the foreign infantry and cavalry regiments (German, English etc). Great buy and I would like to thank Dan for really recommending this great book (probably take the rest of the year to read but so what). Any way waiting for the other two books with extreme enthusiasm. I also ordered 7 packs of Old Glory from the US using my Old Glory Army discount (40% off), even with postage they only cost me 30 dollars Australian each. I ordered 3 packs of Cossacks (as Muscovites), 2 packs of Polish mounted Dragoons (with 4 Essex figures to make 3x8 man units), 1 pack of Polish Haiduks and 1 of Muscovite pike. Lots of painting to come, I think that this year is still to be devoted to the wars of Karl X and next year has to be the GNW. Till next time.